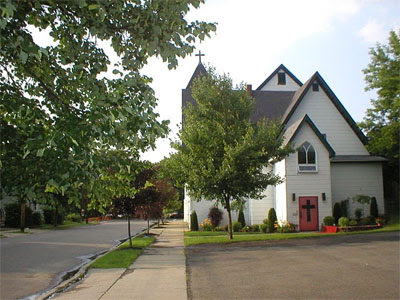 Yes, this is Matt and Anne Kennedy's church in Birmingham, NY that the Episcopal Diocese forced Matt and Anne Kennedy and their children and congregation to vacate on extremely short notice. The Episcopal Diocese at the time told the court in its litigation against Church of the Good Shepherd that the parish was no longer using the property for the purposes for which its Episcopal ancestors had acquired and built it, and had spent money to maintain it over the years. The property has remained vacant ever since. Now the diocese is intending to sell it to a Muslim group. Read more about it here. The cross has been removed from the church, the door painted green, under a new sign, "Islamic Awareness Center." This is beyond farce. OK, can any of the usual TEC apologists who comment here tell me how TEC has been a "good steward" of Episcopal property in this case, and how this safeguards Episcopal property for future generations? This is the usual boilerplate justification for all the litigation expense, right? At the risk of being seen as one of the usual TEC apologists, let me suggest that the sale of a church building in a small upstate NY city where there are two other Episcopal parishes might be good stewardship. And what is "beyond farce" about selling it to a Isalmic religious organization. Is their prejudice working here? Yes, Fr. Daniel - there was a vibrant Christian community using that facility. The DioCNY was, at one point, in negotiations to sell the property to that group. Enter the PB, and all that goes galley-west. Yes, I believe that the mission of a diocese is to support CHRISTIAN endeavors, as much as we respect our Muslim brothers and sisters. Where is the preaching of the saving grace of Jesus Christ here? I am not privy to the ins and outs of negotiations and cannot argue against your conclusion that it was the PB who scuttled them. I can think of arguments against giving the buildings to the departing congregation, as well as some against selling them to that congregation, but those would have been arguments for then and not for now. Church buildings that are no longer needed by the Episcopal Church are often sold and selling to a religious organization would seem to be a good thing. The sale of the property allows the diocese to devote its resources to its mission and not to the maintenance buildings it does not need. I have checked the census figures and found that what I had thought to be true is: the population of the City of Binghamton has dropped by 15% since 1990, the population of the town bu 1%, and the population of the county by 8%. Hi Fr. Weir, the fact is that Good Shepherd had doubled in size from 2002 to 2009 when we lost the building despite the poor demographics in town. Your position is morally bankrupt what was done to this parish was wrong before Almighty God. I was married in this church and know the families that made up this parish. The Bishop refused to allow any personal items to be returned to the church families. The Bishop left the contents of the church in the hands of the Muslim buyers. This points out the vindictive motives of the TEC. At least the Muslims offered to sell the items back to the departing church. As to the assertion that my position is morally bankrupt, I suggest that the anonymous poster read what I have written. I have never ventured an opinion on whether or not the diocese was morally right to sue or to refuse to sell the buildings to the departing congregation. I have only ventured an opinion about the current plan to sell. It is the tendency of some to read more into what I have written that makes trying to have a respectful discussion on this forum so frustrating. I have come to consider the frustration as penance. And now Muslims, who deny Christ, have a centralized location in an area from which to spread their lies among a vulnerable population. Funny how they do that huh? Thanks TEC. Watch out, Peggy38, or you'll be called "prejudiced" for not buying into the equalization that Christians and Muslims are the just about the same. I certainly don't get how the fiduciary responsiblity to dead Episcopalians was honored and fulfilled by taking a Christian site and turning it into a Muslim site when there were Christians still using it and could have leased/purchased it. That's just prejudiced I guess...on the part of the Diocese. I saw this over on the Anglican Curmudgeon and was both saddened and angered over this. I'll spare the anger for a moment and toss out this for thought and comment. In light of this, is +Gladstone in abrogation of his vows and should he not be deposed for this sale of sacred property to a sect that is absolutely antithetical to historic Christianity? I have never ventured an opinion on whether or not the diocese was morally right to sue or to refuse to sell the buildings to the departing congregation. Moreover, at some point, refusing to acknowledge the facts as presented by the evicted congregants and one of the pastors--offered with personal knowledge, no less--comes across as assenting to what was done to them. If I were to try to judge the morality of the diocese's action I would need, in fairness, to hear the diocese's account of what happened.I have only heard from those who left and those who support them and, without hearing from the diocese,I will not venture an opinion. I do not share the view that all Muslims are hostile to Christians - I know enough Muslims who aren't hostile. I won't, therefore, assume that the sale to a Muslim organization in wrong and so far no on one has provided any evidence that the particular Muslim organization is hostile to Christians. In the absence of evidence, I find it reasonable to see prejudice at work. Dan, I don't see how the accusation of moral bankruptcy is worse than your accusation of prejudice. Furthermore, I wonder if you would see it differently if it was your house of worship or that of your friends that became Muslim. And frankly, treating a Christian house of worship as if it was nothing more than a bit of real estate strikes me as theologically bankrupt, and certainly not very Anglican. I recall that the rationale behind all these lawsuits was the fiduciary duty to preserve property for present and future Episcopal ministries. Somehow, I don't that happening here. Thanks, Dan, for doing penance on this forum. I find the notion that one is "prejudiced" unless this Muslim group is particularly hostile to Christianity problematic. A particular hostility is not at issue here. What's at issue is that Christianity and Islam are different. Ignoring that does not take the Islamic faith or the Christian faith seriously on their own terms, for it fails to recognize the real substantive differences between our religions. Of course we agree on some things, but our differences are real and sizable, and the fact remains that this building was built for specifically Christian purposes. Like you, I do not know the conditions of the sale, but it would seem that the seller needs to provide evidence that there were no possible Christian buyers if they are to claim that they are honoring the intent of those who built this church. If they had a choice in buyers, they should justify the choice of this group. The prejudice, it would seem, may lie instead with those who had power over the sale, and who were willing to exercise their power locally in a spiteful way over those they personally disagreed within the TEC. If that's the case, then this action misrepresents Christ (a uniquely Christian goal), and strikes me a very short-sighted and sad. By teaching that Christ is not Lord and leading people away from Him, the Muslims lead their followers away from life in Christ and to their eternal deaths. It would seem to me that this is the ultimate hostility. To clarify the above...I believe that the terse and curt reply was fro Sarah Hey. That is partly true...but all lies are I suppose. Our first two offers did include money from the trust fund that later the diocese would claim. But you leave out, of course, the little detail that at the time we were operating on assurances from the bishop that our assets could be exchanged for property. When we realized he was not being upfront with us we offered to get financing and pay with separate funds. This offer was made in the context of the very same meeting in which we were told, for the first time, that the asset/property swap would be impossible and that they were giving us time to make arrangements and get out or they would sue. In reality it was an ambush meeting. We knew our first two proposals had been rejected but did not know why. We went up with the express purpose of meeting face to face and maintaining what we thought had been honest friendly negotiations. Instead, we were met by two lawyers and a stipulation document. I published all of the details of our "negotiations" in a series of posts entitled "Rector's Journal" which you can easily find on SF. I appreciate reading Fr. Matt's account of the negotiations, but I still have no insight into the reasons for the diocese's actions and will continue to remain unwilling to vernture any opinion about the morality of the diocese's actions. I tend to address or refer to people as they refer to themselves. I have used my first name here and would prefer that people not shorten it. If we were talking about a building where the congregation had dwindled to nothing over the years, I would agree with you -- sell it to the Muslims, and God bless them. But we are talking about a thriving congregation being forced out, and their church being sold to adherents of another religion. These are people who were baptized, confirmed, and married here, whose children learned of Jesus here, who found God in this building. What are they going to think and feel when they pass this building in their neighborhood, now the Islamic Awareness Center? If the Episcopal Church cannot grasp the implications of this, then I would suggest they sell all their buildings to Muslims. They will put them to far better use. I'm glad you display religious tolerance for Muslims, and I commend you for it. I do wish there could be more religious tolerance for fellow Anglicans who cannot walk with the Episcopal Church in their journey away from Scripture and tradition. Although I tend to view David Virtue's reports with a bit of scepticism, I think that the report that Pat cited is probably accurate. I think I understand the rationale for the PB's position, although I do not agree with it. However, it is my understanding that the departing congregation had already found a new home and was no longer interested in purchasing the buildings. If that is not the case, I would appreciate knowing that. I have to admit that I am probably likely to see prejudice when it isn't there. I do think it appropriate to point out language that might be seen as a sign of prejudice, but I need to find ways to do that without being offensive, and I am sorry that I was offensive. Your timeline is incorrect. Our offers came long before we were even sued. We were trying to avoid a lawsuit in any way that we could. We did NOT have a place to go. After we lost the lawsuit we believed we would be worshiping in a gym for the foreseeable future. It was only the gracious intervention of a local Catholic church in the days after we were displaced that saved my family and congregation from homelessness. Also, the Virtue report is incorrect. The diocese filed all litigation. We did not initiate the lawsuit. All of this is a matter of very public record. Rather than simply making knee-jerk assertions about people and a situation about which you admit ignorance, why not do some research? I am sorry that my responses appeared tobe knee-jerk. I understood that the offer to purchase came before the lawsuit that the diocese brought. I have said that I have no knowledge of why the diocese decided to sue. All I have said is that, in the absence of any evidence that there are current offers that are better than the one the diocese intends to accept, attacking the decision to sell to a Muslim organization might reasonably be seen as preudice against the diocese or Muslims. I was glad when I heard that the congregation and your family had been saved from homelessness. I am sorry that my defense of the diocese has been awkward and that it has offended others. I have tried to be fair and to limit my comments to the one matter about which I am still fairly sure that I have the facts. So far no one has provided any evidence that there were other current and better offers. All that has happened is that I have been criticized for either supporting the dioscese's decision to sue rather than sell to the congregation (which I haven't done) or for not taking the time to learn enough about that part of the story to form a judgment about the diocese's actions. The latter assertion is true, but of no real importance as I have made only one comment on that part of the story, which was that given NYS law the diocese was almost guaranteed a judgment in its favor. RE: "In the absence of evidence, I find it reasonable to see prejudice at work." Why any Anglican or Episcopal Christian would give a flying fig as to Fr. Daniel Weir's seeing "prejudice at work" I have no clue. If Fr. Daniel Weir sees prejudice than that's cool for him. RE: "but I still have no insight into the reasons for the diocese's actions and will continue to remain unwilling to vernture any opinion about the morality of the diocese's actions." Agreed. Fr. Daniel Weir will be unwilling to venture any opinion about the morality of the diocese's actions. Obviously, the rest of us will venture an opinion, however. What a repellent, grotesque, corruption that diocese and its bishop demonstrate themselves to be by their actions. Spiteful. Petty. And full of malice, they reject a valid offer to buy the building from the parish -- the third time *without* the use of any of the parish's-claimed-by-the-diocese's funds, they sue the parish, and then they sell the parish -- for LESS MONEY -- to an Islamic center. I think that perfectly reveals just who they are and how full of bile they are. The only good news about all of that -- the selling of a parish for LESS MONEY to an Islamic center -- is that 1) they get less money which is always a good thing for such a heretical and corrupt organization and 2) they reveal just how enraged and spiteful they really are. I take some satisfaction from noting their own boiling rage at Matt Kennedy and the parish of Good Shepherd. Matt definitely got under the bishop's skin -- and for such a malevolent, tin-pot, petty, little bullying man as is the bishop, I think that's a great sign. Actually, it's obvious andI admire your ability to use so many negative adjectives in a sentence. Why thank you, Fr. Daniel Weir. Always a pleasure and a joy. Weir+: It appears to me that you should do some research before you come onto blogs and write the comments you make. For instance, you say that Muslims are not all hostile to Christians. Fair enough. A simple statement. Then you respond to the meatier statements of the discussions which center around the Episcopal Organization's regarding litigation and the intrusion into the PB's intrusions into the negotiations between the diocese and The Church of the Good Shepherd. There, you retire to what appears to be your repeated observations that you can make no observations regarding matters about which you don't feel qualified to make. For instance you say: . 1 "...I still have no insight into the reasons for the diocese's actions and will continue to remain unwilling to vernture any opinion about the morality of the diocese's actions". 2. "... I would need, in fairness, to hear the diocese's account of what happened.I have only heard from those who left and those who support them and, without hearing from the diocese,I will not venture an opinion." 3. "... I am not privy to the ins and outs of negotiations and cannot argue against your conclusion that it was the PB who scuttled them." 'Hi Fr. Weir, the fact is that Good Shepherd had doubled in size from 2002 to 2009 when we lost the building despite the poor demographics in town. Any way you do the math, the diocese comes out looking very very small." Matt's comment is the very meat of this discussion sir and I strongly recommend that you refrain from venturing you have no trust in what is being stated by the orthodox Christians here and instead fall back on the diocese's position (where you do venture opinions), and yet come to these blogs, having done no research yourself. I fail to see the purpose of your participation other than to conclude that you are here solely to maliciously criticize the Orthodox position. My apologies for the errors and repetitions in the above. My comment which, I believe, is clearly (although repetitively) supported by Fr Weir's contributions may be understood with little difficulty. Having ventured an opinion about the current sale, I should have stopped. It is clear that few people were willing to let me decline to venture an opinion about other aspects of the story. As to my dismissing of Fr. Matt's comments, I thought that the growth of the congrgeation and the size of their offer were beside the point because that offer is not a current one. You have made it clear that you will not pass judgment on DCNY and the bishop regarding this issue. Fair enough - loyalty to colleagues, superiors, and the refusal to bad mouth your organization are admirable qualities. I believe GK Chesterton said that everything you do is a theological statement. TECs national legal strategy is a theological statement. +Adam's dealings, negotiations, and legal strategy towards Good Shepherd in Binghampton NY, but also towards St Andrews in Syracuse are theological statements. Sure, this pales in comparison to the theological statements made by, say, the Irish Catholic bishops. But many people pay more attention to the theological statements made by actions than the ones made through words, and look for consistency between the theology of words and the theology of actions. I will consider total silence given the level of rudeness in the responses to my comments.